Saman dance is originally from Southeast Aceh in the highland of Gayo. The name of Saman is use to commemorate the creator of saman, Syeikh Saman. Then, the dance usually dance by 10 people or more. Eight people as dancers and two people as the lead singer called Sheikh. A sheikh appointed to organize the movement and sing a poem or a song followed by the various movements by the other dancers. On the other hand, the dance does not use the musical instruments accompaniment. The lyric sung by the sound of clapping hands, chest, and thighs. The movements and the songs has a dynamic relation and synchronous. Tor Tor dance is a dance that originated in North Sumatra. Tor-Tor originally not a dance, it is a complement of Gondang Uning-uningan (traditional instrument) based on the philosophical tradition itself. In a traditional ceremonies in Mathura where Gondang Uning-uningan sounded, always be equipped by manortor event. Initially, manortor just held on the custom events. However, since it developed, and now Tor-tor dance also done at the entertainment events by modifying tor-tor in such a way to be more appealing to the audience. Rumah Gadang or Gadang house is a traditional house of Minangkabau. The houses are built on high poles and the foundations are stones. Gadang’s roof form the shapes of a buffalo horn, and it is often associated with Tambo Minangkabau Alam stories. It has the story about the Minang people’s victory in the event of fighting against the Javanese buffalo. Moreover, this house is so big, with the number of rooms to nine, eleven and even more. The name Big House refers to its function. Rendang or in Minangkabau called the rendang is one of Minangkabau’s traditional food which very famous in all over Indonesia and even in the world. Rendang has several colors, that are red-brown, brown and blackish brown. Then, this dish made from coconut milk cooked until the water content reduced or sometimes until it dried. That’s why it is called randang which means dry processed food without containing water. Rendang is often served with steamed rice, ketupat or a rice cake, and lemang, lemang is a glutinous rice, coconut milk and salt, and cooked in a hollowed out bamboo stick lined with banana leaves. Songket is a woven fabric that belongs to Malay ethnics of Indonesia in South Sumatra Province. The word Songket taken from Malayan language Sungkit, which means to hook. The way of making Songket is including hook and pick a group of threads and slip the gold and silver threads in it. Songket Palembang exist since the Palembang Sultanate. At that time, the craft Songket is a side-business for the people of Palembang. Based on historical records, the one who deserve to wear songket at that time was only the king or sultan and the relatives. Then, in the past, Songket is worn by the Sultans in Palembang as the royal clothes. Lenong is a traditional performance of Indonesian theater show. It is usually equipped by the decoration according to the story. Then, the show starts with Gambang Kromong instruments and traditional songs like Jali-jali, Stambul, Persi Balok and etc. There are two types of Lenong, Lenong Denes and Lenong Preman. The types are differentiate by the story. Lenong Denes shows about royal kingdom story. While Lenong Preman’s story is about the daily life, sometimes about a hero, a family and etc. Ondel-ondel is a giant doll, made of by paper and rattan and always present in every party or gathering among Betawi (Jakarta people) in Jakarta. According to the story, Betawi ondel-ondel is a personification of the ancestors of Betawi people. They always watch over their descendants from evil. The doll always come in pairs as a male and female ondel-ondel, sometimes with a kid ondel-ondel. On the other hand, before making Ondel-ondel, craftsmen provide incense, seven-kinds of flowers and a gruel for various accessories. Then, it is done in order to the ondel-ondel will run smoothly and the spirit that resides in the giant doll is a good spirit. The same thing goes after the ondel-ondel is already finished. Angklung is an Indonesian musical instrument, Originally from West Java. It consists of two to four bamboo tubes suspended in a bamboo frame bound with rattan cords. The tubes are cut off by a master crafts. Its to produce certain notes when the frame is shaken. Each Angklung produces a single note. Then, several players collaborate in order to play melodies. On the other hand, the Angklung is related to traditions, arts, customs as the identity of Indonesia. Angklung played during ceremonies such as rice planting and harvest. Moreover, the collaboration of Angklung music, teach about the cooperation, mutual respect among the players along with discipline, responsibility, as well as artistic and musical feelings. Literally, Kujang means the heirlooms that have a certain strength comes from the gods. As a weapon, Kujang occupies a very special position in the community of West Java. In ancient time, Kujang could not be separated from the life of the Sundanese people. Thus, its function as agricultural equipment. This statement is contained in the ancient texts, Sanghyang Siksa Kanda Ng Karesian from the 16th century. Then, the tradition that using Kujang as farming equipmentnow still can be seen in the area of ​​scaffolding, Ciamis, on the Baduy in Banten and Pancer Pangawinan in Sukabumi. Keris is a short sword originally from Java especially Central Java and East Java, Indonesia. It antique’s shape makes Keris easily distinguished from other swords,It has a sharp point in its both sides. The characteristics of Keris are unsymmetrical shape. As well as lath arch, and most of them have a decoration or patterns on its lath. Unesco has already recognized it as one of culture heritage in the world. In Javanese, Keris usually used in groom’s traditional dress. Moveover, Keris is also a symbol of male vertility. Then, in Yogyakarta palace, on Malam Satu Suro or the first day in the Javanese Calendar. The entire weapon including Keris are paraded around palace while praying to ask the God. Wayang is a Puppet show played by a puppeteer by moving the selected character of puppets according to a delivered story. In each pagelaran or puppet show, the puppeteer added the sindhen or singer and the gamelan players. So, the puppet show involving many people. In Indonesia, Wayang has spread to almost all over Indonesia. There are a lot of types of wayang in Indonesia, such as : Wayang Kulit Purwa, Marionette Puppet from Sunda, Wayang Betawi Wayang Bali, Puppet Banjar, Wayang Palembang, Puppet Krucil, Puppet Thengul, Puppet Timplong, Wayang Kancil Puppet Grass, puppet smacking, Jemblung puppet, wayang Sasak and wayang Beber. Sasirangan fabric is one of batik types, originally from South Kalimantan. The making process has been done in a modern way. The materials of fabric sasirangan is a cotton fibers. Even though In the process, the raw material is not only cotton, but also from non-cotton material. The types of fabric that’s used as raw materials are basically consists of three types. The types are silk, sateen and cotton. 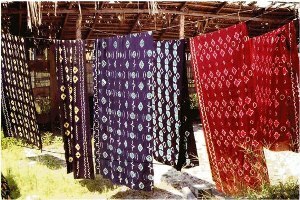 Sasirangan fabric itself is generally a type of fabric made with puncture technique baste, then tied with raffia string or yarn and then dyed resemble to the prosess of making a tie-dye cloth. The Hudoq is a traditional dance of the Dayak Modang in East Kutai, East Kalimantan. It is a sacred dance that is closely associated with ritual or ceremonial tradition. When dancing, the dancers of Hudoq using a mask resemble to the beasts that made from wood. The bodies are covered with banana leaves, coconut leaves, or betel leaf. Each of the dancers portray the character figures of hudoq, picture of a god who has supernatural powers. 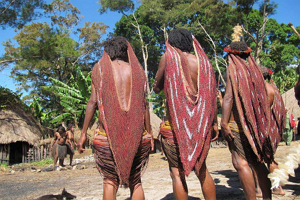 Hudoq dance can be found in the province of East Kalimantan in certain occations. Then, it is arranged from village to village after people dig a hole or plow the land to grow rice paddies in September to October every year. Kolintang is a musical instrument of Minahasa, North Sulawesi. The material is from wooden that light but solid enough, and the woods are arrange in parallel position. The sound of Kolintang is quite long and able to reach high notes and. The word Kolintang, comes from the sound of Kolintang itself Tong when its in the low tone, Ting in a high pitch and Tang as the middle tone. How to play kolintang is by hitting the the woods. On the other hand, the role of Kolintang in the community is for entertainment when there’s a festtivals, harvest gatherings, parades, wedding ceremonies and etc. In the past, Kolintang used to communicate from one house to another. 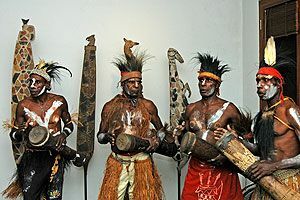 Lariangi dance is originally from Wakatobi in Southeast Sulawesi Province. Played by twelve women or more. This dance is used to be played at the Palace in a form of movement and a song with its main function is as entertainment. The word Lariangi consist of two syllables. Lari which means to decorate or carve, in the form of a circular formation sometimes and some have a sitting also painted on the movement of a fan which varies according to the songs sung. Then, Angi which means the ones bedecked with various ornaments. Angi is used to convey information or a specific purpose in the form of advice, instigation or as entertainment that appears on the dance and singing. Pakarena dance is a traditional dance from Makassar, South Sulawesi. It performed by female dancers who perform gentleness of Makassar’s women. This dance is performed by the hand movement that swung to the left and right and forward in a slow movements. However, the highest hand movement lifted only until shoulder’s height and never up to the head’s height. The right hand always holding a fan. In the 20th century, this dance tradition started out from the palace and become a very popular performance. 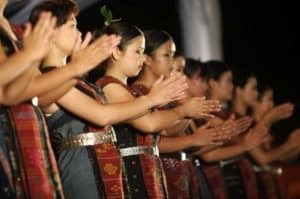 On the other hand, the dance is accompanied by the music of two headed drum or Gandrang and a pair of traditional flute instrument, Kuik-Kuik. Gendang is bahasa for Drum in English, so, Gendang beleq is Beleq drum. The drum called Beleq because its size is large compared to general drum. There are two types of Beleq drum, the one called gendang mama (male) and drum nina (female). The difference between the two drum is in the sound. Gendang Mama sounds louder than gendang Nina. Beleq drum usually played on a stage or in the open field. On the other hand, the composition of the complete drum performance consists of 40 people. Therefore, Gendang beleq always performed on special occasions such as wedding ceremonies, Festival, Welcome guests. Gendang beleq generally can be found in the West Nusa Tenggara Province. Sasando or commonly known as a stringed harp-like musical instrument of Rote people, East Nusa Tenggara. It is made from palm leaves and wood. Sasando’s sound is a result from vibration. The sounds came out by picking the strings.It is born as the inventor’s inspirations by interacting with nature. Sasando music used in almost every social event of the community like celebrating the birth of a baby, wedding ceremony and even when there’s somebody passed away. Sumba’s House also called Bale. The houses differentiated according to the social status of its owner, reinforcements for the house to nobles and commoners Bale. House of Sumbawa is in a form of stage. Sumbawa’s high roofs shapes like a boat at an angle of about 45 degrees. Then, in the front of the top there Lebang which shows the owner’s social status. If there is more Lebang indicates the higher nobility status of the owner. Besides Lebang, the size of the house also shows the owner’s social status. Noken is a woven bag handmade from wood’s fiber or leaves by people in Papua and West Papua Provinces of Indonesia. Moreover, The bag has a lot of function, such as for carrying plantation produce, firewood, babies or small animals, for shopping and for storing things in the home. Noken also worn at a traditional festivals. The process of making noken requires great manual skill, care and artistic sense, and takes several months to master it. By the time, the number of people making and using Noken is decreasing. However, Factors that threatened its survival include lack of awareness, weakening of traditional transmission, decreasing numbers of craftspeople. As well as competition from factory-made bags, problems in easily and quickly obtaining traditional raw materials, and etc. Tifa is a Papua percussion instruments as a symbol of peace for the Papua people in the past when there’s a war between tribes in Papua. The elder of the tribes sounding the tifa to gather the representatives of the two sides tribes to make peace. However, nowadays, the war didn’t occurred, so, the drums/tifa no longer used for a peace. Then, it more used in a tribe customs, such as traditional party, wedding, welcoming important guests and more. The Tifa founded in the Papua, West Papua, Maluku and East Nusa Tenggara Provinces. There are various ways that can be taken by the youth in an effort to preserve the national culture. Experience the culture, preserve the culture performed by jumping directly into an experience culture could be one of the way to keep and maintain the culture. Then, the other way is through the cultural knowledge to preserve the culture by making an information center about culture to educate or to develop the culture itself. Thus, the younger generation could know about the culture of its own. Therefore, we as a youth and future generations of Indonesia let us together to preserve the culture of the nation, filter currents of globalization that is not in accordance with our national culture to meet Indonesia’s unity and filled with hope. Who else if not us, when else if not now.